High Horses is happy to release information on a new program. With generous funding from a local family High Horses is able to pursue a new program for our community. 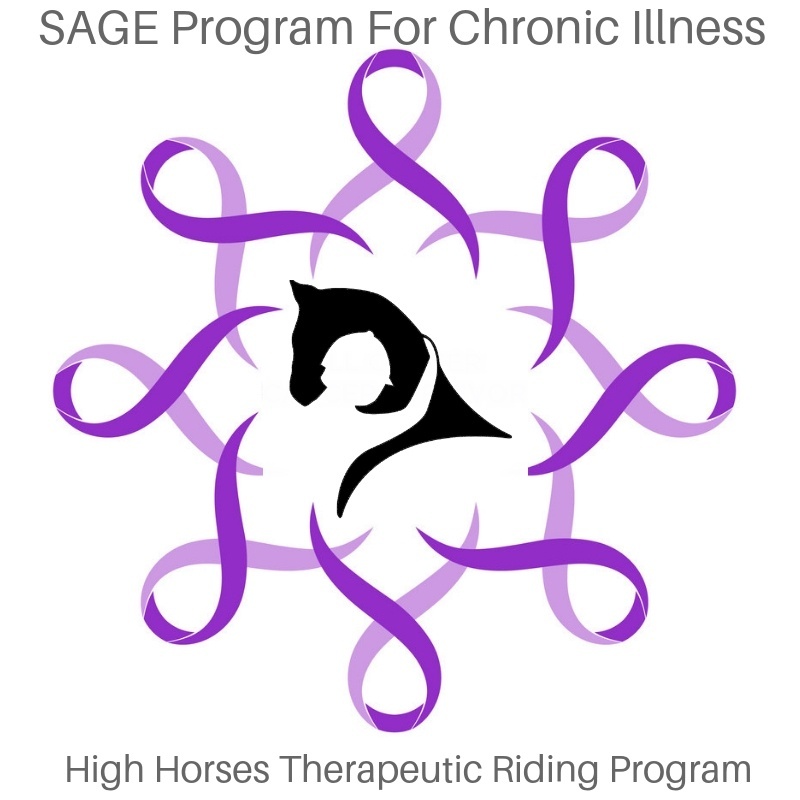 The SAGE program will be offered in hopes of reaching people dealing with chronic illness. Cancer being a major contributor to chronic illness, yet there are many other maladies that go along with chronic illness and this is an opportunity to have an environment for combining equine therapy with other modalities for well-being. Our four-legged friends can help to improve social skills and impulse control, reduce anxiety, alleviate depression, lower blood pressure, and improve fine motor skills. Equine therapy has many additional applications, including decreasing isolation and promoting confidence, self-esteem, communication, trust, and spiritual connection. Riding can prove very beneficial in terms of treating cancer and other chronic illnesses, as it releases endorphins and serotonin, which are known to reduce stress and depression. The pilot program will run 3 weeks from April 8th through April 22nd with a group of adults from 9:30-11:30 on Mondays. We will reassess the program and host another pilot for May 6th through June 10th with the Monday of Memorial day not in session. We do hope to offer a pilot program for children and adolescents in the future. The participants will learn how horses communicate their thoughts and emotions through body language and how to halter, groom, and tack a horse with some riding experiences to enjoy as well. No prior riding experience is needed to participate. Other modalities like Yoga, music, aroma therapy, journaling etc… may also be incorporated. Not only does equine therapy assist chronic illness, but it also benefits cancer survivors by increasing strength and fitness levels. We utilize the power of the horse to heal, regaining strength and a sense of peace. Working on dexterity by using grooming tools to brush the horse with up and down & side to side movements helps the clients improve their strength after surgery. This program is offered to those dealing with chronic illness and their caregivers/significant others. Class size is limited to 8 participants. Please contact us to register to be included. $200.00 per participant. Sliding scale fee available, please inquire.